Lavender & Aloe Vera Deodorant is an effective and gentle deodorant spray that seems cool and soothing, thanks to aloe vera, lavender and tea tree oil. Contains no aluminum salts and is free of preservatives. No parabens, mineral oils or silicones. Suitable for vegans. 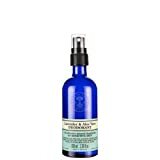 Volume: 100ml spray Ingredients: Alcohol denat, Aqua, Aloe vera (Aloe barbadensis) leaf juice powder, Lavandula angustifolia (Lavender) oil, Cananga odorata (Ylang ylang) oil, Melaleuca alternifolia (Tea tree) oil, Glycerin, Sodium usnate (Lichen) extract, Benzyl alcohol, Benzyl benzoate, Benzyl salicylate, Coumarin, Eugenol, Farnesol, Geraniol, Isoeugenol, Limonene, Linalool. This entry was posted in Organic Health Products and tagged Aloe, Deodorant, Lavender, Neal's, Remedies, Vera, Yard by Organic Health. Bookmark the permalink.